Running along the Frano-Italian border is a very high ridge with two well-known summits on either end, the Dent du Géant at the west end and the Grandes Jorasses to the east. 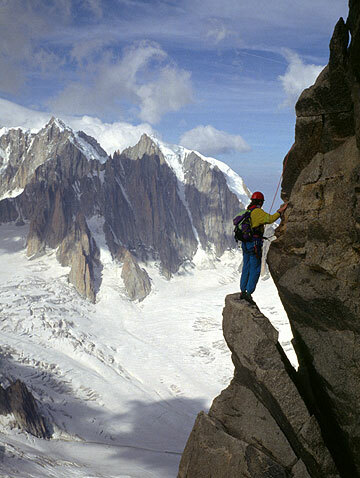 While the Grandes Jorasses is a difficult climb by almost any route, the impressive fang of the Dent is more reasonable and makes a great objective. 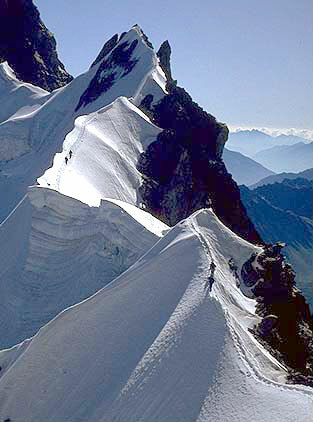 The ridge line to the east of the Dent du Géant is the famous Rochefort Arête, arguably the most beautiful snow arête in the Alps. Here, a narrow and outrageously exposed "trail" follows the narrow crest, winding among giant cornices and wild snow features. The Arête and the Dent make a great combined day's outing, including both snow and ice climbing on the former and as well as the rock climbing on the latter. The route on the Dent is on the SW side and shady in the early morning. So the logical itinerary has us on the Rochefort in the morning, when the snow is firm, and climbing on the Dent in the afternoon. Both of these climbs are accessed from the Torino Hut, which is accessible completely by cable car from Chamonix. This is essentially a one day climb, with a hut stay prior to the ascent. Returning to the Salle à Manger we will leave our ice climbing gear, and perhaps our mountain boots, don rock shoes and begin our climb of the Dent du Géant. The rout curves up and left to reach the huge slabs of the SW Face. Crack systems are followed, curving back right to the highest summit. 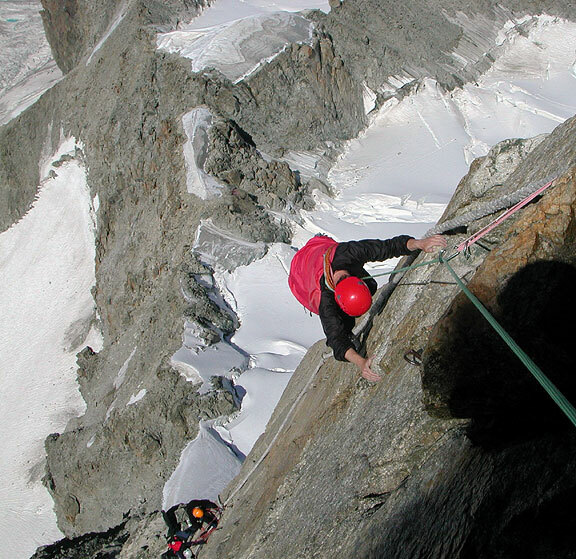 The route has been equipped with much fixed rope to make an otherwise very difficult ascent a bit more "democratic". While most climbers use these ropes as useful handholds, it is also possible to climb the route free at about 5.9 in difficulty. Descent is by rappel on a direct route on the vertical South Face. 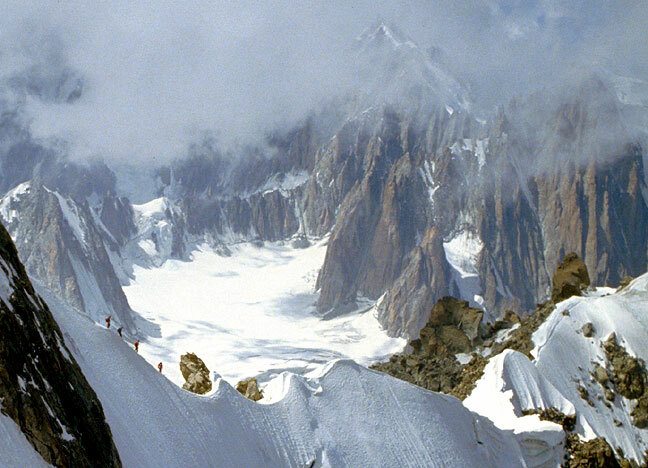 The combination of the Rochefort Arête and the Dent du Géant require both rock climbing skills as well as those needed for steep snow and ice. The rock climbing is not overly difficult, at least if the fixed ropes are used as an aid, but the route is unrelentingly exposed, so climbers need to be comfortable on very exposed terrain. Though the technical difficulties are not great, this is a long route and a big day. Good fitness is key, as well as a certain degree of comfort in crampons on steep slopes. Climbers need to know how to flat-foot up moderately steep frozen snow, as well as front point on harder ice. On the rock of the Dent, climbers need to be able to follow about 5.6 comfortably and have experience on multi-pitch rappels. Fitness is important, as the day is long. From the Torino hut there are a number of other climbs readily accessible. The Traverse of the Aiguille d'Entrèves can be done on the day you climb move to the hut, as can the SE Ridge of the Tour Ronde. Also recommended is the East Arête of the Pyramide du Tacul, which can be also be done on the approach day, as you traverse the Vallée Blanche to the hut.